CLOSEOUT -- ThunderShirt Calming / Anti-Anxiety Vest for Dogs -- Gray. $39.95. "I gave this to my grandchildren's dog and they are very happy with it." Stops the panting and hiding in the powder room during storms. Amazing. I was the biggest skeptic about this product, but had to do something for my golden lab. She is just a mess when it comes to fireworks and thunder. So I took the leap and purchased the thunder shirt for Sadie. It was the best July 4th that I have spent and we have also had some thunder. She used to pace and pant heavily during and after the fireworks and thunder storms. She has improved over half of what she used to be. Sadie actually likes having the thunder shirt on. No problems with her getting used to the garment. Thanks so much. My family thought I was nuts for purchasing the thunder shirt, but they saw for themselves that it helped her immensely. "It has done wonders for Madison." My vet was the one that recommended using this product. It has done wonders for Madison. It has a very calming effect on her when it storms. Great product. "Very happy with this product." Very happy with this product. Has made a world of difference to Woody when thunderstorms roll in. I recommend it to all my friends who talk of having dogs with thunder anxieties. Fantastic product! "I've suggested the product to several others who have easily frightened dogs." Mix (part Saluki? ),German Shepard,Poodle. Family pet. We got this for our one dog, who's scared to death of thunder and fireworks. It seems to have helped her quite a bit, and better than the various pills we tried giving her over the years. I've suggested the product to several others who have easily frightened dogs. It was amazing. We put it on my brother's dog on Christmas night, and she calmed right down. She seemed to really enjoy it. He and my sister in-law loved it! You guys, and your staff are totally awesome! "I loved it, but it did not work at all." "He now comes to me to put it on him if he hears thunder." I have been so surprised with this shirt. My dog would shake all over and hide under something every time it started to thunder. Loud noises would scare him badly. I was afraid he was going to have a heart attack or something it was so bad. With the thundershirt, he is much calmer. He still will have a small tremor, but nothing like before, and he does not hide under furniture anymore. The shirt has not completely cured the problem, but has helped my precious little dog so very much. He now comes to me to put it on him if he hears thunder. "I think it's great so far." I've tried it on both my dogs, one who suffers anxiety during thunder storms and the other who just thinks he's the boss of other dogs, and it seems to have calmed them in both situations. I have planned on ordering a second vest in the near future for the bossy dog. I think it's great so far. "We have recommended it to everyone we know who has a dog." It's amazing! She is immediately calmed by it and is content to stay next to us rather than trembling in fear and climbing into our laps. She even leads us to it to put it on her hours before it storms. We have recommended it to everyone we know who has a dog. Thank you! "My dog LOVES the Thundershirt." My dog LOVES the Thundershirt. Our house got hit by lightning which caused anxiety issues to our dog, Bailey. Her symptoms kept getting worse so we took her to the vet. He didn't have much hope that the condition would improve and could only suggest medicating her at least 30 minutes prior to any storms. Great advice if I was at home all day. Plus, I hated seeing the effects of the sedation with her. I heard about the anxiety vest and got it. The first time I put it on her we were in the garage and a huge storm had just come up, lightning, thunder, the works. She started to panic. I put the vest on her and stood with her as the storm started. I could see she was confused at first between reacting to the storm and wondering what the vest was all about. No kidding...within a few minutes we walked into the house, she layed down, and got through the storm without medication. Now anytime the weather is looking bad, I just get her vest, which she loves having on, and she gets through the situation flawlessly! I even take it with us on trips. "I'm glad I got this product. Makes for less sleepless nights." She is severely afraid of storms and night time starts shaking panting scratching and does everything she can to get out of the house. We got her the Thundershirt. It has done wonders for her. It does not take her anxiety away 100%, but I would say about 90%. She now will lay down by my feet and does not stress as bad. I'm glad I got this product. Makes for less sleepless nights. "He has no anxiety induced by storms when the vest is applied. I think he actually likes the vest." My satisfaction: We live in Florida where thunder/lightening storms are a daily event during the summer months. I was having to medicate my dog daily to avoid the anxiety that often caused him to hurt himself trying to get out of the house during a storm. Many times, I would anticipate a storm and no storm would come through and my poor dog was groggy for no reason. I was also concerned about the effects that the continued use of the tranquilizer would have on a 10 y/o dog. Since getting the thundervest 2 month ago, I have had to medicate my dog only once or twice. And that was required because we did not apply the vest prior to a full blown storm (we were not at home). We now place the vest on prior to leaving him during the anticipated storm hours. He has no anxiety induced by storms when the vest is applied. I think he actually likes the vest. "It worked with just a few claps of thunder, but a night with lots of thunder for several hours did not work." It worked with just a few claps of thunder, but a night with lots of thunder for several hours did not work. "The vest works, I watch our dog go from pacing and panting when she hears thunder, to calm within minutes of wearing it." The vest works, I watch our dog go from pacing and panting when she hears thunder, to calm within minutes of wearing it. "I would recommend this to any dog owner whose dog has problems. 5 stars!" I purchased the thundershirt for my beagle mix because she has seizures. She shakes violently from these seizures & we couldn\\\'t do anything to comfort her. With the thundershirt, her seizures, although not gone, have lessened in severity by more than 50%. It\\\'s amazing. She loves it and we love it. I would recommend this to any dog owner whose dog has problems. 5 stars!!!!! Small Mixed Breed. Family pet. My dog Jack has always been seriously afraid of thunder. He tries to get out of the house and has injured himself and damaged the house trying to do so, if we are not around when a storm comes up. The Thundershirt is not a miracle, but it has really helped. Since we began using it, Jack has been much, much calmer. Staying near me quietly during all but the very loudest thunderstorms -- he even stayed very calm through Hurricane Irene. He really seems to like wearing it. When I suggest putting it on, he comes and waits for me to get it on him. I strongly recommend this product. Also, for those who say it didn\'t magically fix your dog\'s aversion to fireworks: Don\'t take your dog to fireworks! "Wonderful and very well made." I would highly recommend the shirt. I learned about the calming effect that dogs feel from a comforting wrap at Dog Camp in Ashville, So. Carolina. And here I am in WI doing it. Wonderful and very well made. "The thundershirt makes him a normal dog." Have a dog with severe stress/excitement induced colitis. The thundershirt makes him a normal dog. "Overall I would recommend the product." The thundershirt seems to be working well so far. My dog seems less anxious and doesn't shake like she used to when she rides in the car. I did take her into the pet store with her shirt on and she was still very anxious. Overall I would recommend the product. "The shirt really takes the edge off his anxiety and he is about 90% improved with the shirt on." Our 10 year old Golden has become frightened by storms, and fireworks. The shirt really takes the edge off his anxiety and he is about 90% improved with the shirt on. "At first she didn't like it but now she comes to me when I pick it up. " At first she didn't like it but now she comes to me when I pick it up. It's a great product and I'm glad I purchased it. "Relieves most of her anxiety"
German Shorthair Pointer. Family pet. "The ThunderShirt calms her down quite a bit. " Poms are wound pretty tight and our Coco is no exception. She is a barker and when afraid will try to climb up to sit on your head if she could. The ThunderShirt calms her down quite a bit. We had a bad thunderstorm last week and came home to find her shaking under the bed. I put the shirt on and was able to make dinner with her sitting calmly on the rug. She gets mad when I take it off to put it away.We are very happy with the shirt. "It has definitely helped out dog." It has definitely helped out dog. "It is a very good product"
It is a very good product and does work well. "Unfortunately, I'm in TX where it's really hot so she must hang out in the house for 2 hours in order for it to have a more lasting effect." Unfortunately, I'm in TX where it's really hot so she must hang out in the house for 2 hours in order for it to have a more lasting effect. She calms down and becomes a sweet snuggle bun. Without it, she's the psychodog. Very high drive but unable to calmherself to just &quot;be&quot;. Thank you. This product works! I am amazed by the results of htis product. Works fantastic. "Sky has always been afraid of storms, usually found in a closet or under a bed. My ex wife bought her a cheap version at PetSmart which helped very little if any. She did report this one helped, but she still shivered the whole time, but at least was not terrified." Sky has always been afraid of storms, usually found in a closet or under a bed. My ex wife bought her a cheap version at PetSmart which helped very little if any. She did report this one helped, but she still shivered the whole time, but at least was not terrified. My dog has started to have extreme anxiety when my kids come over. He gets so excited he has seizure like activity while here and exhausts himself. This vest has been very beneficial in calming him enough to not exhaust himself, but he still does it (turns in circles, snaps at the air, seems to be seeing something that's not there) I am going to consult his vet also, but the vest has helped a lot! Thank you!! "I would totally recommend this vest, well worth it." My dog would tremble with fear everytime a storm was brewing, even thunder off in the distance would make him tremble with fear. I put the vest on him and it calmed down his trembling by about 90%. He still trembles during a storm but with the vest on, not nearly as bad! Only problem I have is that when my dog is wearing his vest he shakes his body all the time, as if he is trying to shake it off and this drives me crazy, it is so annoying! But when I take the vest off him, he stares at it and whines, so I lay it in front of him and he is not happy until I put it back on him. Just don\'t get it. However I would totally recommend this vest, well worth it. "Our dog doesn't mind having the vest on." Our dog doesn't mind having the vest on. She is absolutely terrified of storms, fireworks and any loud popping noises. It takes her a few minutes to calm down once it is on, but for the most part it works. She doesn't always quit shaking completely, but it is 90% better than before. "It just doesn't seem to help much. " It just doesn't seem to help much. I was hoping it would help. He gets so upset with Thunder. "The ThunderShirt fits well, and my dog actually likes wearing it." The ThunderShirt fits well, and my dog actually likes wearing it. I can't say it cured her thunder phobia, but it does seem to calm her a bit more. "Although they are still scared, they do not tremble and panic with their shirts." The shirts are great; 2 of my dogs are terrified of lightening and we have lots of Tropical Wave pass over this time of year. Although they are still scared, they do not tremble and panic with their shirts. "Timing of putting on the vest is crucial." Timing of putting on the vest is crucial. "She is better than before the vest, yet the thunder still bothers her and she paces. We are working on it." She is better than before the vest, yet the thunder still bothers her and she paces. We are working on it. "The Thundershirt does seem to provide her some calming effect but it hasn't solved the problem." English Cocker. Hunts. Family pet. For some reason our six year old ECS has developed severe anxiety around storms this year. The Thundershirt does seem to provide her some calming effect but it hasn't solved the problem. "It had no positive effect"
My dog is terrified of fireworks. He shakes uncontrollably and has a lot of anxiety. I thought I would try using the vest. It didn't really seem to do anything for my dog. He still shook and had a lot of anxiety. It had no positive effect on him. I returned the vest to the company. "The shirt does not alleviate all of Lucky's anxiety." The shirt does not alleviate all of Lucky's anxiety. He still does his stress-panting. However, when it begins to thunder, he absolutely cooperates when we go to put it on him. He approaches and stands real still as we put it on him. It does seem to be at least somewhat comforting to him. "I used the vest for three days in succession on each dog and observed no change in behavior." I have now used the vest on three hyper labs with no noticeable results. I used the vest for three days in succession on each dog and observed no change in behavior. The owners of the dogs also saw no change. "The dog is a real thunder chicken." The vest was a gift to one of my daughter's dogs. Buffy is terrified of storms and can sense/smell them when the sky is blue, no clouds in sight. My daughter has to hold her and hug her during storms with only moderate success. The dog is a real thunder chicken. Zeus is afraid of everything. We had to take the wind chimes off our deck and his own shadow is his biggest nightmare. We tried the Thunder Vest and it worked in that he wasn't afraid anymore, however, this lack of fear instilled in him an instant feeling of thrill seeking. Every time we opened our front door Zeus would charge out of it, ready to take on the world and then we'd have to chase him down. We opted to remove the vest, better that he stay at home and fear the wind than charge dangerously at a semi truck. No affect at all. Will return for a refund. I didn't hate it, but it was not helpful for my dog when a thunderstorm took place. Couldn't get it on my dog. He has serious issues. Ge is a rescue I got. He was beaten badly and is very fearful of humans. He does fine around other dogs but not people. I thought this product might help, but he gets too scared when he even sees it. My dog hated it and couldn't wait to get it off. He just bit and bit at it. Stressed him out more than he was already. 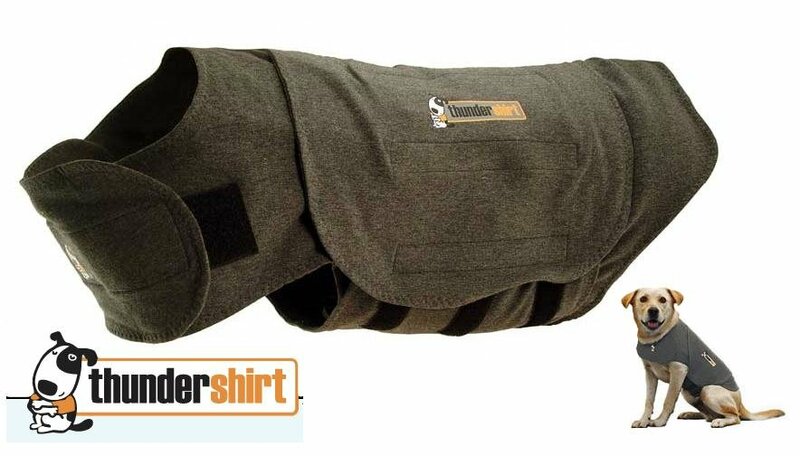 The Thunder Shirt applies gentle, constant pressure around your dog's torso, which has a dramatic calming effect for most dogs if they are anxious, fearful, or over-excited. Over 85% of dogs show significant improvement in anxiety symptoms when using Thundershirt. Recommended by thousands of veterinarians and dog trainers. Thundershirt has been developed to be very easy to put on. Just lay it over your dog's back and secure with the chest and torso straps. The Velcro fasteners make Thundershirt very adjustable to many different body shapes. 1. Place the Thundershirt on your dog's back and wrap the Short Flap under the torso. 2. Wrap the Long Flap under the torso and secure with Velcro onto the short flap. Make a comfortable, but snug, fit. You should be able to easily slide your fingers between the Thundershirt and your dog's torso. 3. Wrap the Top Flap down onto the Long Flap and secure with Velcro. Adjust to improve the snug fit and keep Thundershirt securely in place. 4. Wrap the Chest Straps around the front of the dog and secure with Velcro. You should be able to easily slide your fingers under the Chest Straps and should not feel restricting around your dog's neck. Thundershirt is an excellent treatment for most types of dog anxiety and fear issues. For many anxieties, such as noise, crate, travel, barking and others, just put the Thundershirt on your dog and you will likely see results without training. For more complicated anxiety cases, we recommend using Thundershirt as part of a behavior modification program. Thundershirt is also a useful tool for managing excitability or hyperactivity with strangers, on a leash, or in a training environment. Thundershirt's calming effect can help your dog to focus (or refocus) his energies in a more constructive direction, allowing training to be more effective. Before putting Thundershirt on your dog for the first time, we recommend offering a small amount of food to your dog using the Thundershirt as a "plate". Dogs typically become more comfortable and trusting of something that "brings" them food or anything that they associate with food. So this is an easy little trick to quickly create a positive association with Thundershirt for your dog. Thundershirt is made out of durable, washable fabric. When necessary, Thundershirt may be washed in a regular cycle using regular laundry detergent and warm water. Hang to dry. To remove dog hair from Thundershirt's velcro, try using a standard dog "slicker" brush. A couple of strokes and the velcro hooks will be nearly completely hair-free. FAQ: Is overheating a concern when using a Thundershirt? Except in extreme conditions (e.g. 90 degrees Fahrenheit in the sun), overheating is not typically a concern when using a Thundershirt. Dogs cool themselves primarily through their mouths and paws, and a Thundershirt is constructed of a thin, breathable fabric. If you feel that overheating might be a problem for your particular circumstance, monitor your dog for any signs of overheating, such as heavy panting or tongue hanging out of the mouth. Remove the Thundershirt if you see any signs of overheating.